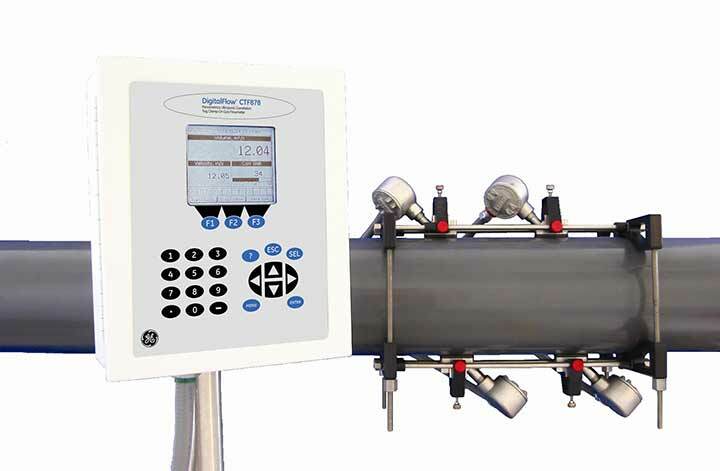 The DigitalFlow CTF878 Correlation Tag Clamp-on Gas Ultrasonic Flowmeter is suitable for metal pipes and for pressure as low as atmospheric. It is non-invasive, has no wetted parts or moving parts. There is therefore no process down time or significant installation costs for this clamp on technology. The CTF878 uses a new technology called correlation tag, to determine the flow rate of gases. 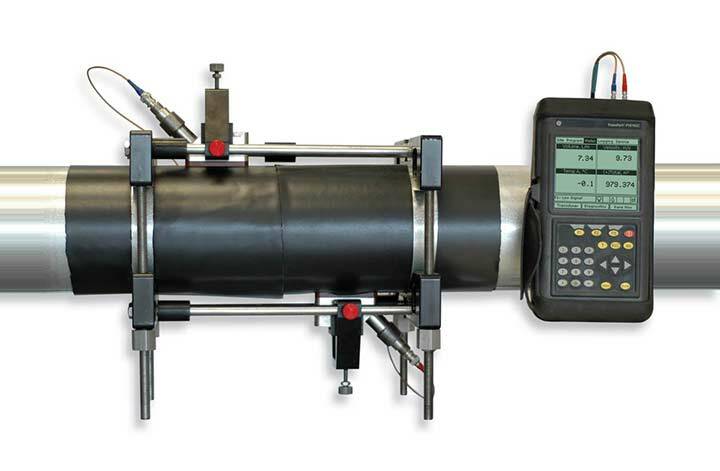 This is like no other clamp on gas flowmeters. The CTF878 flow meter is supplied with two pairs of ultrasonic transducers - the first measure the upstream disturbance, and the second (situated downstream) record the downstream disturbance. The flow meter constantly samples these traces and correlates the two traces. When the flow meter recognises that the same disturbance pattern has travelled along the pipe, it is possible to measure the velocity. This is done constantly every second. Each pair of transducers includes a transmitter sending ultrasound in a continuous wave mode through the fluid to the receiver, forming an upstream and downstream interrogation path. The continuous wave signal is modulated by turbulence and local density variations that are characteristic of a moving gas. 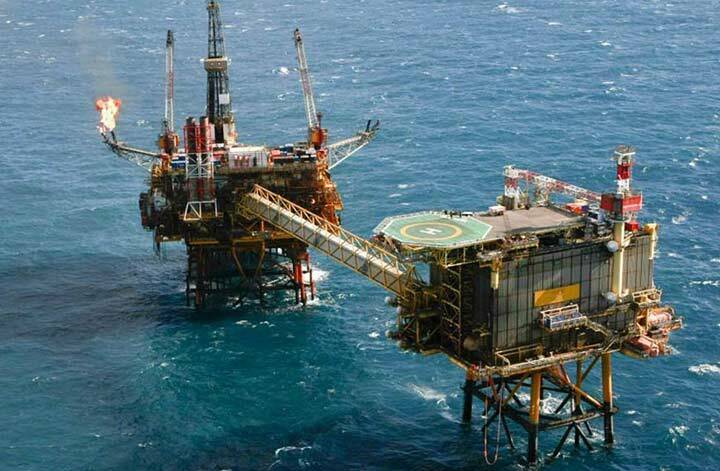 In the past, a restricting factor in gas measurement has been the signal strength of transducers: having to send an ultrasonic signal through the metal pipe wall, through the gas, and then back through the pipe wall again. New clamp-on gas transducers produce signals that are five to ten times more powerful than signals of traditional ultrasonic transducers. This new technology produces clean, strong signals with marginal background noise. Specifications assume a fully developed flow profile (typically 20 diameters upstream and 10 diameters downstream of straight pipe run). 0.074 lb/ft3 (1.2 kg/m3). Gas should not be wet or saturated with moisture. Pipe Materials Most metals and plastics. No lined pipes. Panametrics PT878GC Clamp on gas flow mete suitable for most gases including natural gas, compressed air, nitrogen, steam, argon, helium and methane.